With the new high quality electronic white board Panaboard UB-T880 / UB-T880W Multi-touch your lessons or business meetings will take on a whole new look. To improve the interaction and cooperation of participants. Hub USB with 2 additional ports to enable link-up with other devices and improve the quality of your presentations without having to connect to a pc. To conclude, Panaboard affords a wide series of tools – ranging from pens to erasers to apps for use in achieving special effects. 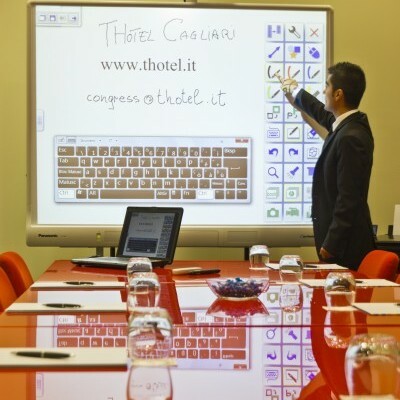 For further details on the electronic white board and the range of possibilities afforded please contact congress@thotel.it or call +39 070 47400.